Mapping is an increasingly common method used to predict instrument-specific preference-based health-state utility values (HSUVs) from data obtained from another health-related quality of life (HRQoL) measure. There have been several methodological developments in this area since a previous review up to 2007. To provide an updated review of all mapping studies that map from HRQoL measures to target generic preference-based measures (EQ-5D measures, SF-6D, HUI measures, QWB, AQoL measures, 15D/16D/17D, CHU-9D) published from January 2007 to October 2018. A systematic review of English language articles using a variety of approaches: searching electronic and utilities databases, citation searching, targeted journal and website searches. Full papers of studies that mapped from one health measure to a target preference-based measure using formal statistical regression techniques. Undertaken by four authors using predefined data fields including measures, data used, econometric models and assessment of predictive ability. There were 180 papers with 233 mapping functions in total. Mapping functions were generated to obtain EQ-5D-3L/EQ-5D-5L-EQ-5D-Y (n = 147), SF-6D (n = 45), AQoL-4D/AQoL-8D (n = 12), HUI2/HUI3 (n = 13), 15D (n = 8) CHU-9D (n = 4) and QWB-SA (n = 4) HSUVs. A large number of different regression methods were used with ordinary least squares (OLS) still being the most common approach (used ≥ 75% times within each preference-based measure). The majority of studies assessed the predictive ability of the mapping functions using mean absolute or root mean squared errors (n = 192, 82%), but this was lower when considering errors across different categories of severity (n = 92, 39%) and plots of predictions (n = 120, 52%). The last 10 years has seen a substantial increase in the number of mapping studies and some evidence of advancement in methods with consideration of models beyond OLS and greater reporting of predictive ability of mapping functions. The online version of this article ( https://doi.org/10.1007/s40258-019-00467-6) contains supplementary material, which is available to authorized users. CM and DR reviewed studies, extracted and analysed the data from the review, and wrote the manuscript. SH and AR reviewed studies, extracted data and contributed to the manuscript. RW undertook the searches and contributed to the manuscript. RA and JB were involved in designing the analysis and contributed to the manuscript. JB and CM were supported in the preparation and submission of this paper by the HEOM Theme of the NIHR CLAHRC Yorkshire and Humber: www.clahrc-yh.nihr.ac.uk. The views expressed are those of the author(s), and not necessarily those of the NHS, the NIHR or the Department of Health. CM, DR, SH, AR, RW, RA and JB have no conflicts of interests to declare. Full data extracted from each of the studies is available in the electronic supplements. Zorginstituut Nederland. Guideline for economic evaluations in healthcare. 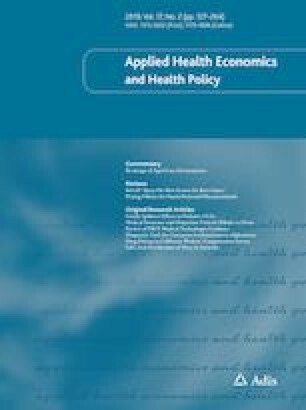 2016. https://english.zorginstituutnederland.nl/publications/reports/2016/06/16/guideline-for-economic-evaluations-in-healthcare. Accessed 18 Sept 2017. CADTH. Guidelines for the Economic Evaluation of Health Technologies: Canada—4th Edition. 2017. https://www.cadth.ca/dv/guidelines-economic-evaluation-health-technologies-canada-4th-edition. Accessed 18 Sept 2017. ISPOR. ISPOR Scientific Presentations Database. [cited 2017 18 September]; Available from: http://www.ispor.org/RESEARCH_STUDY_DIGEST/research_index.asp. Accessed 18 Sept 2017. Group, E. EuroQoL Group Website. [cited 2017 18 September]; http://www.euroqol.org/. Accessed 18 Sept 2017.